Psycho Solo Diver – Online Diving Blog and more!April, 2016 | Psycho Solo Diver - Online Diving Blog and more! You are currently browsing the Psycho Solo Diver – Online Diving Blog and more! weblog archives for April, 2016. Drone pilots can bomb and terrorize from thousand of miles away; with the same type of technology, Stanford University has developed a SCUBA diving robot. Well, since the diving robot is unable to breathe, the term SCUBA may not apply here; I’m sure it can’t get bent either. 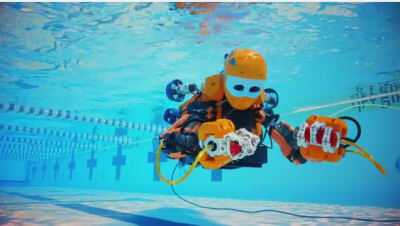 The robot has artificial intelligence built into it, however there is a “virtual” diver who controls and experiences what the robot is doing. The robot has arms, hands, stereo vision and the virtual diver can even feel what the robot picks up. The robot has been designed to go as deep as 2,000 meters (if you are an American, that is 6561.68 feet), which is about 6,000 feet deeper than any technical diver can go. A real SCUBA diver fist bumps a robot diver. Can you image 100 years from now, when people will go to a shop and be able to virtually control a diving robot anywhere in the world?